Capitalists@Work: Nunc Dimittis - That Makes My Week! Nunc Dimittis - That Makes My Week! This blog has long had a soft spot for Chris 'Crapper' Huhne. It is a pile of ordure - sorry, anaerobically-digestable matter - maturing nicely to become fuel for generating subsidised electricity. Well, it's only fitting. The Judge may have a harder spot in mind. Either way, I am content, even as Cleggy weeps his big crocodile tears. What an excellent start to the week. And at Candlemas, too ! - if you'll pardon the profanity, but Sunday's sermon is still fresh in the mind. Nunc dimittis ; I have lived to see the day. What is he saying in the picture? "Forgive me Father, for I have sinned"? Pity that flagellation has gone out of fashion. One can only hope he is confined to a new eco prison. Powered only by renewable energy. few in the House likes him. Except for some of the greener and redder sandalistas he is alone. Who's Lucas going to sit next to at tea time now? Galloway ? "CH - You're Nicked, job's a good'n"
I've read the texts and I'm actually quite saddened by them. I was looking forward to watching a good by-election scrap, especially one this interesting with so many dynamics at work, but a pall has been cast over the whole thing now. 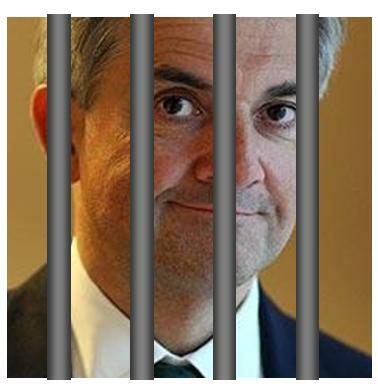 Oh happy days, Huhne in prison. What is it with these smug smirking snide bossy backstabbers? Like McShane a supporter of the EU - an oligarchic system built from the ground up by cheats, so supported by cheats. an issue that unites thee and me, Budgie! I do wonder whether, over and above the life sentence he will so rightly deserve, he will be forced to pay back his MP's salary, expenses and pension contributions which he has been claiming falsely for two years. It takes a heart of stone not to laugh your head orf! And for ffs, don't set up a lad's mum for chokey, they kind of take it personally. Ejeet. Anywho - footnote 2261 of a relatively boring parliamentary year. I want to know how he managed to put off the evil day for 10 years! Perhaps there's hope for some justice in the end for a few others I could mention. And how much has all the legal stuff cost us all as "the British Taxpayer"? Thanks, ND. What is frightening about Huhne is not that he lied, lied for two years, and only pleaded guilty when his attempts to stop the case failed, but that he is the type of man running this country. What have we done to deserve such people? How could a father treat his wife / son like that. I felt sullied just reading the texts and regret having done so. Just because something is interesting does not mean it is newsworthy. Budgie - are you really suprised? By their ability to take actions without regret, sociopaths will always rise to positions of power easier than anyone with a modicum of concience surely? Elby: 10 years would be more appropriate. Date it back to the time of the offence. I read somewhere that he is worth over 17 million, so he won't miss a few years' worth of stolen salary. it is reay a nice things "" This blog has long had a soft spot for Chris 'Crapper' Huhne. It is a pile of ordure - sorry, anaerobically-digestable matter - maturing nicely to become fuel for generating subsidised electricity. Well, it's only fitting.